Preventative eye care plays an important role in protecting vision and general health. 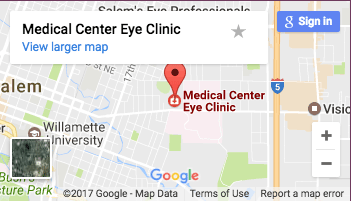 Because it is always easier to prevent problems than to fix them, regular exams by skilled ophthalmologists at Medical Center Eye Clinic Salem Oregon, can make for a healthier life for you and members of your family. If you observe these recommendations, you will greatly increase your chances of good, life-long vision. Regular exams – As a rule, people under 50 years of age should have an exam every two years, while seniors and those wearing contact lenses should be seen once a year. Every child should have a vision screening or an exam at least once before starting school. Patient Advocacy – Be aware of any risk factors for eye disease. Think in terms of family history of any vision loss, particularly macular degeneration and glaucoma. If you have any risk factors be sure to come in and have an exam. Diet and Lifestyle – Ocular health is highly related to general health. It is well known, for example, that sources of omega fatty acids, such as cold water fish and flaxseed oil, are good for the eyes and the rest of the body. Good nutrition, exercise and avoidance of damaging lifestyle factors will protect your vision. Eye protection – Be sure to protect your eyes from traumatic injury during high risk occupational or recreational activities.